In the daily life routine, we need a lot of assistance from other people for our work. So, we usually hire personal assistants to manage our routine chores and to keep an organized track of all our activities. With the tremendous advancement in technology, we came across mind blowing applications at times. Cortana is one such achievement of the technology world. It has virtualized the concept of personal assistance by providing us a complete personal assistant inside our PC’s and mobile devices. Cortana has been developed by Microsoft and it is built upon the concepts of natural language processing. It has been developed for Windows 10, Windows 10 Mobile, Windows Phone 8.1, Microsoft Band, Xbox One, iOS, and Android. Cortana has the ability to do unbelievable tasks. It has the ability to set reminders for places, people and time and unlike the usual reminders, it is able to remind you of any task at a specific location or even when talking to a specific person. Because of natural language processing capabilities, it is able to search for specific content on the computer. Cortana even has the ability to identify any music playing nearby and match it to a song. Cortana is powered by the web browser Bing. In addition to above, Cortana has the features to perform calculations and conversions, to track flights and packages, to find facts, check the weather, get directions, set alarms, launch programs, send email, to create calendar events, simple chat options and even get a list of commands for help. 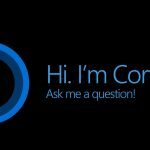 In short, Cortana competes against the Apple’s Siri and Android’s Google Now voice assistants fully and Microsoft has used the concepts of Artificial Intelligence to design this feature.